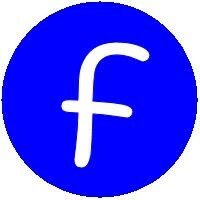 My current friends and I met at a run group that was formed at the YMCA. We started off just running around the block a couple of times and then on to running races. We then moved on to coffee dates, dinners, movies and girls nights out. We became known as the Fierce Girls. We have many t-shirts to prove it too! Our group has evolved and doesn't really run as much anymore. 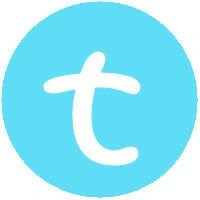 People went back to work, kids grew, and lives changed. We've still managed to keep in touch and meet at 5 am for 3 mile runs and coffee. We still meet for birthdays, dinners and nights out. We are there to support each other. We had a big group that got together to run a breast cancer race to support our fierce friend! Last year this friend was diagnosed with breast cancer. This was eye opening since she was the first person my age that I knew personally to be diagnosed with this disease. Breast cancer survivors are all around us, but it is not a given. So much pain, emotion, worries, and treatment comes before you can say you are on the other side. While I have never been in this situation, I am sure it can be a scary and lonely time. Even with people to support you, I'm sure you can get lost in your own head thinking about all the What If's. I wanted my friend to know that we were with her, thinking of her, and caring about her even if we couldn't always be with her. 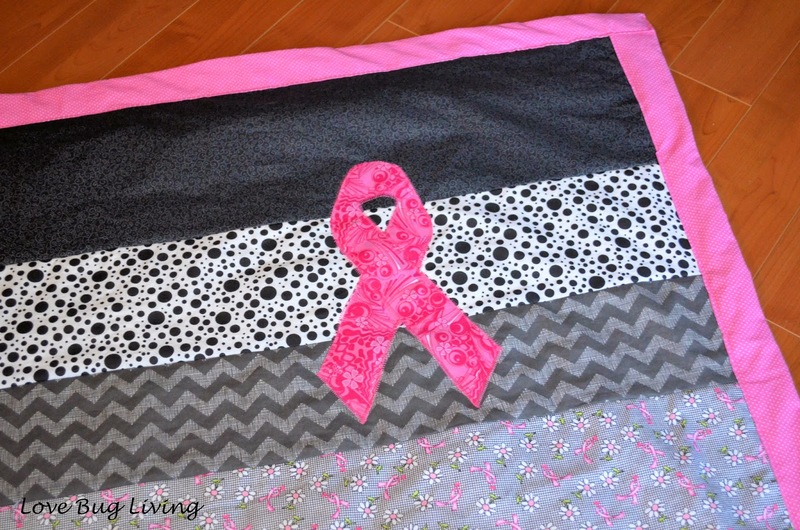 That's why I wanted to make her a pink ribbon quilt, to keep her warm and comfortable. Something to keep with her when she needed a snuggle. I decided to make a quilt as you go strip quilt. It would be throw blanket size, measuring about 45 in. x 60 in. I used crib sized batting. I found a variety of fabrics in blacks, whites, and pinks. I also found a pink print for the quilt back. I cut my strips in all different lengths, with the width being the width of the material. I laid out my strips to get the look I wanted. 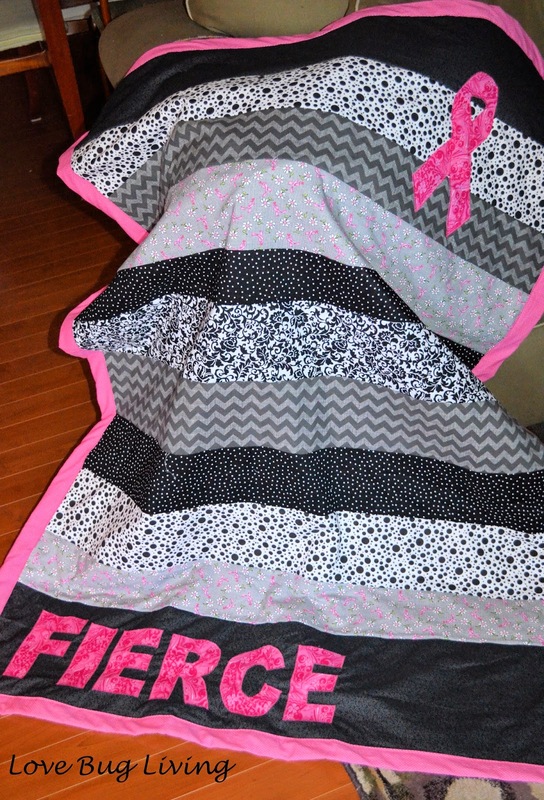 I also wanted to add the word Fierce and a pink ribbon. 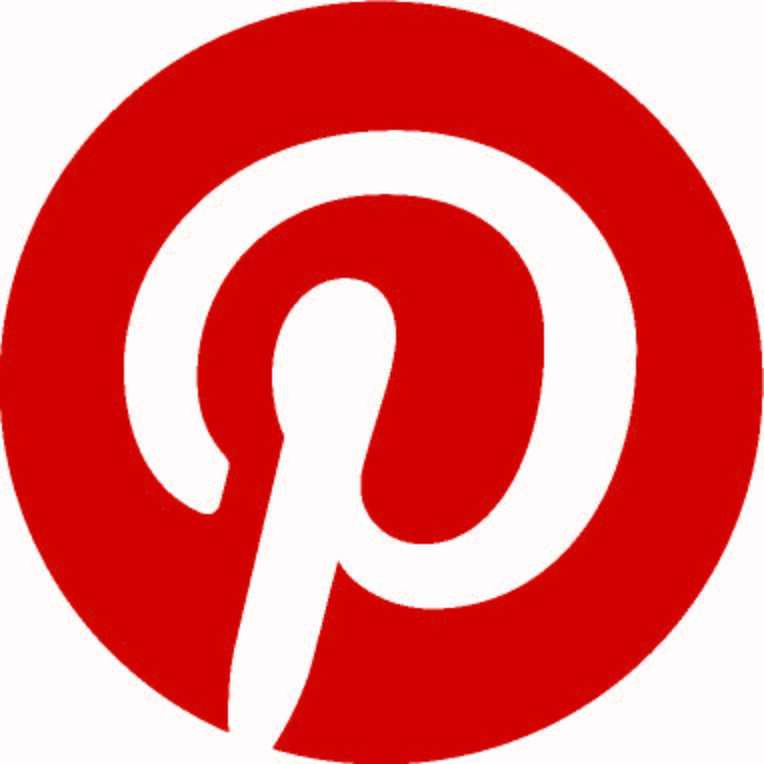 I found images online that I used as a pattern to cut out my fabric. For the back, I wanted to have a larger piece that could fold forward and create my binding. I bought a piece of fabric that was 45 in wide and 3 yards long. I cut this long piece in half. I matched up the lengths and sewed them together to create the back. It ended up being 90 in long and 54 in wide. 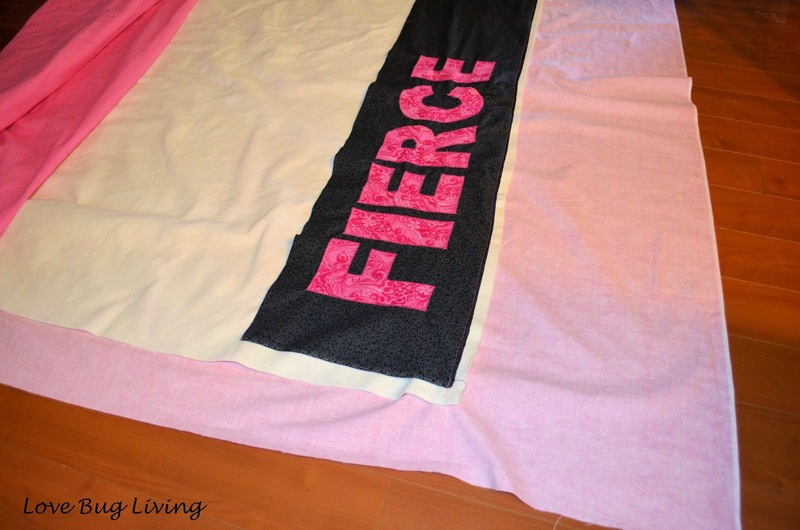 I used fusible web and an iron to attach the word FIERCE to my first strip. I zig zag stitched around the outside edges to keep them in place. Now it's time to start quilting. 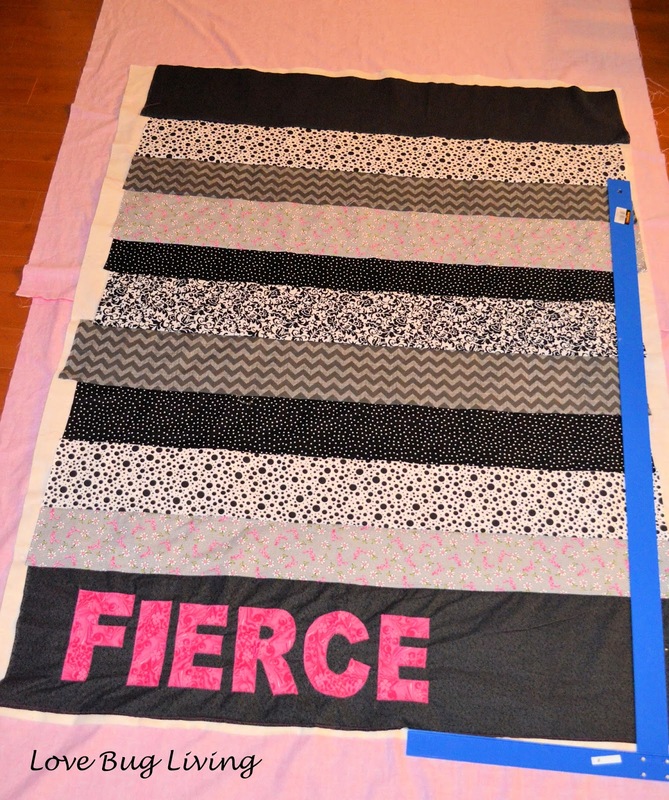 To create your strip quilt, you will need to lay out your quilt back, face down. Top it with your batting, and then line it up with your first strip of fabric. Sew along the bottom edge of your first strip, sewing together your top piece, batting, and your back fabric all sandwiched together. I centered my batting and front piece in the middle of the backing. Remember we will be folding the back forward to create the binding. If you are using a separate binding, you can use a single piece of backing and line all three up. After your first strip is attached, line up your second strip, right sides together, along the top edge of your first. Sew your second strip in place, sewing through the second strip, first strip, batting and backing. Now flip your second strip up and smooth in place. 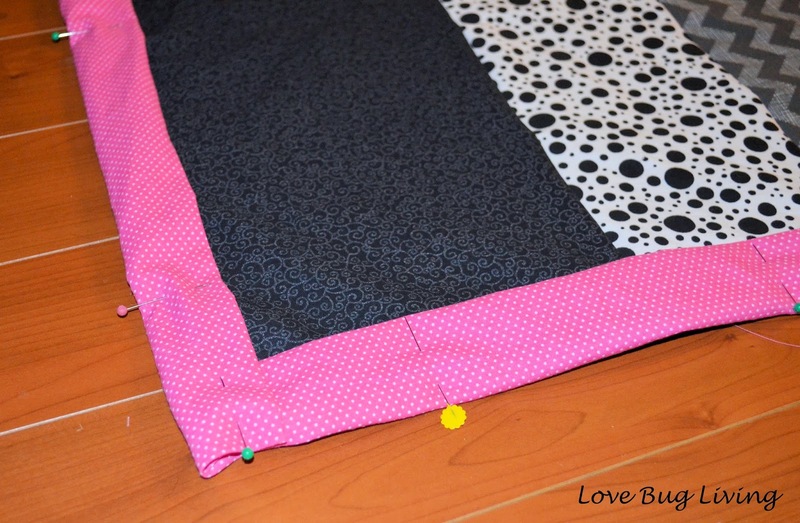 Continue adding and sewing your strips in place, quilting as you go. 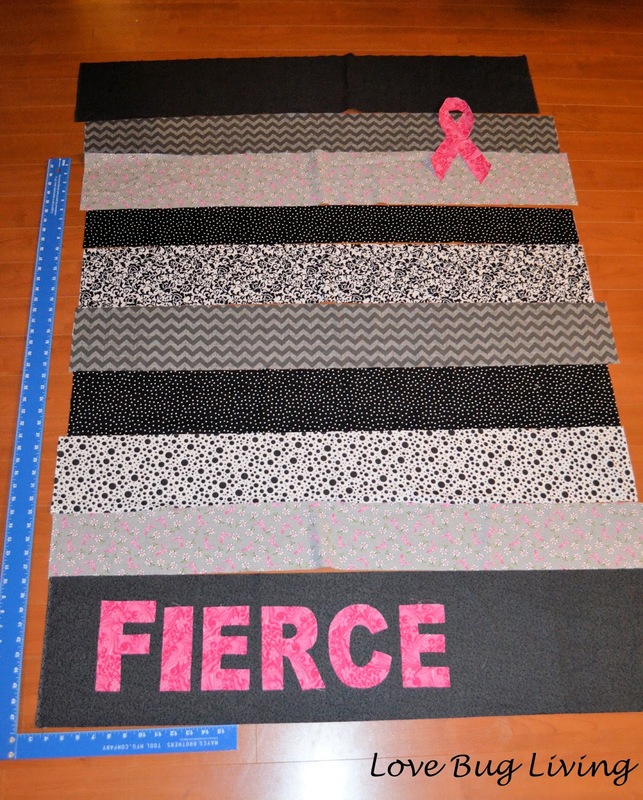 Once your strips are all sewn in place, your quilt will look something like this. Now is when I added my pink ribbon. I ironed the ribbon on towards the top of my quilt. I stitched around the edges. The outline of the ribbon will show through the back of the quilt as well. Trim the edges leaving an equal amount of excess material all the way around your front. 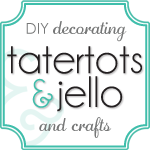 The amount of extra material really depends on how thick you want your border. Mine was a bit thicker, so I had about 2.5 inches around. 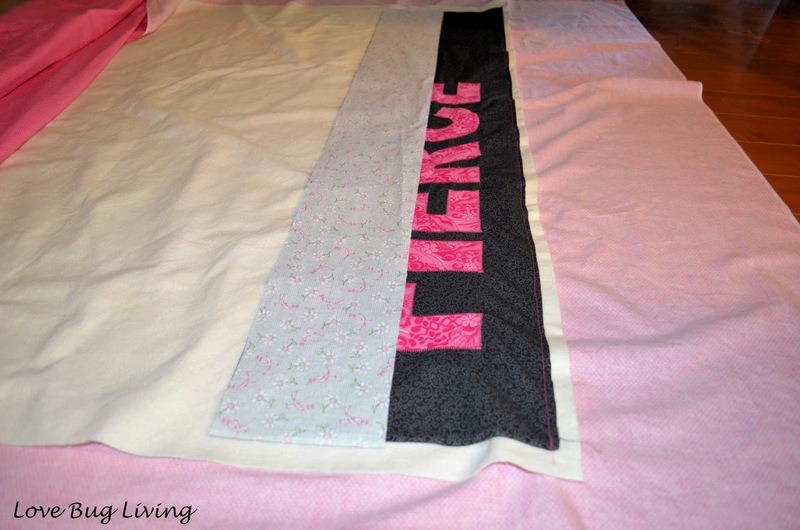 Fold your extra material towards your quilt front until the edge lines up with the front edge. Iron in place. Fold this border over again, so that it is covering the front edge of the quilt. Pin in place. Do this for all four sides, squaring off the corners. Here is another TUTORIAL on binding with mitered corners. I was very happy with how it turned out. The pink really popped against the black and white fabric. I wanted her to know just how Fierce she really is! The size was perfect for her to bring with her for treatments or just curl up on the couch. Today my friend has completed her treatment and is doing well. She is a strong woman and I hope she continues to only get healthier and happier. I know my friend loved this quilt. 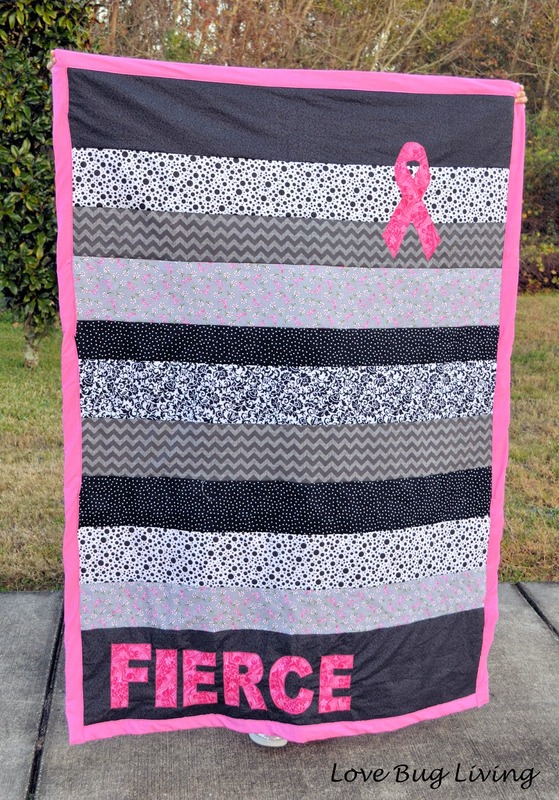 If you know someone that could use some extra love, maybe this pink ribbon quilt could brighten her day. Plus it's simple enough for a beginner to sew. Be healthy! How much would you charge to make one of these amazing quilts? I usually don't sell my quilts, but I'm considering it. 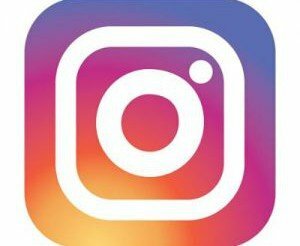 I've had quite a few requests, so I'm going to research how much it would cost me to make and let you know. 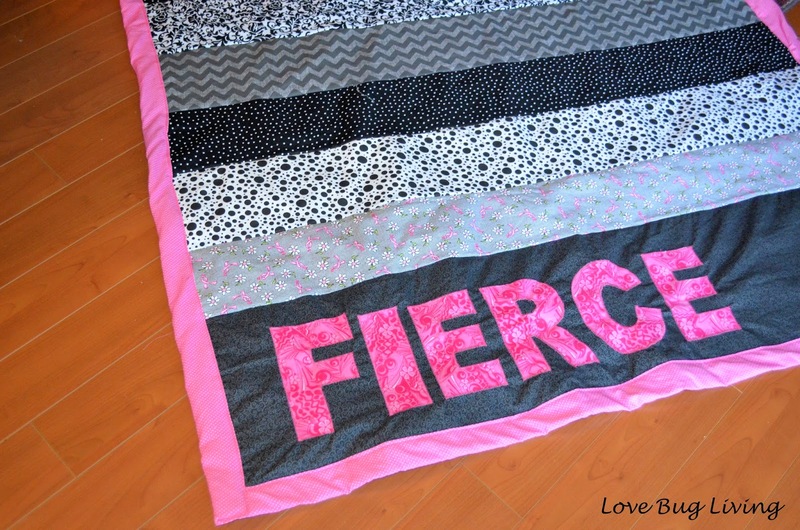 If you are in need of having a quilt like this made, message me. I would be glad to do this for you. I would love to buy one! Curing cancer without side effects seemed impossible before the advent of canessiac cancer treatment at CBD International. Now it feels like a child's play. 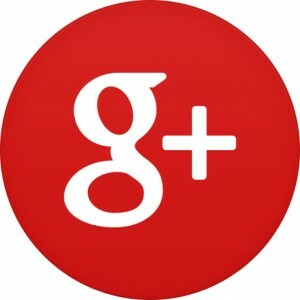 Interesting and interesting information can be found on this topic here profile worth to see it advice .